With the conclusion of Seattle Regionals, it has become clear that players will need to either be playing a Garbodor variant themselves, or be playing something that does well against Garbodor if they hope to succeed in the current format. 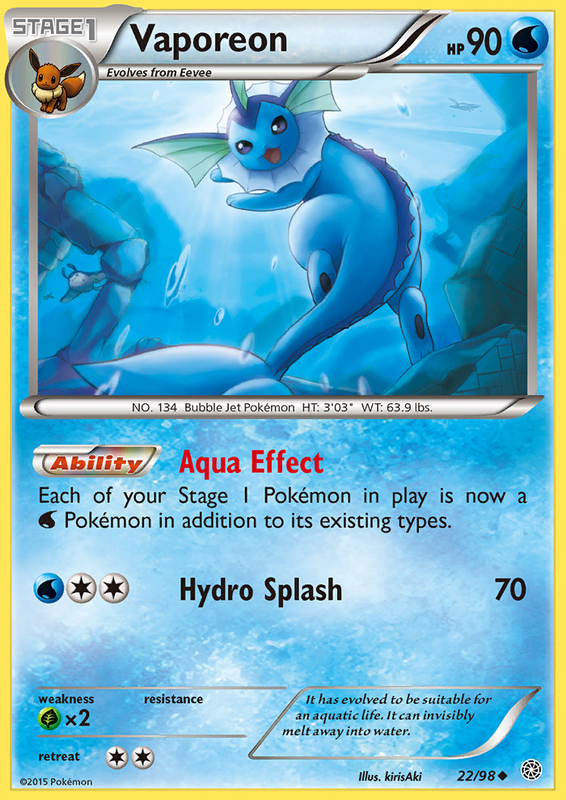 Garbodor was a dominant force at Seattle, composing 75% of the Day 2 decks with Sam Chen eventually winning the tournament with Drampa GX/Garbodor GRI. One of the decks that I’ve found to be most successful in testing against Garbodor is my Umbreon GX/Zoroark deck. 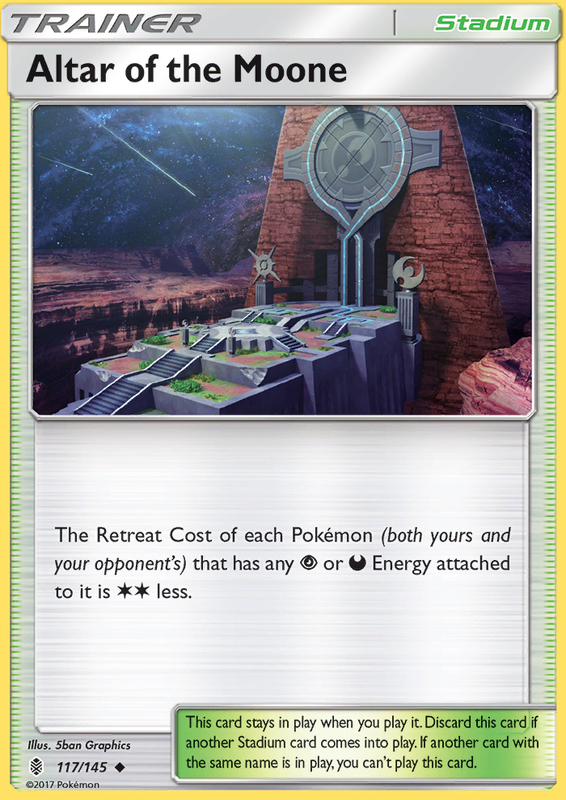 I wrote about this deck when Sun and Moon first came out, and the archetype is definitely greatly improved with the new cards from Guardians Rising. In this article I will go over my updated list for the deck and go over why I think it could perform well at upcoming tournaments in this format. 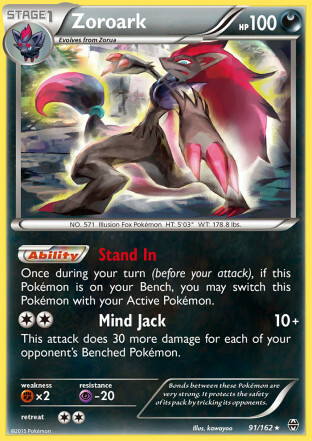 This article is more of an update on “A Moonlit Illusion – Umbreon GX/Zoroark” than a full article on its own, so I would recommend giving that read as well. In this section I will go over the cards that weren’t in the deck last time I wrote about it, and which I have in my current list for the deck. Some of these are some minor things I’ve tweaked in deckbuilding dating back to last format, but most are entirely new things brought to us from Guardians Rising. Tapu Lele GX – When I first wrote about the deck, I discussed how I didn’t like playing Shaymin EX in the deck, but that I felt obligated to play it to give myself increased consistency by allowing myself to turn an Ultra Ball into draw. In the updated list, I have completely replaced Shaymin EX with Tapu Lele GX as a consistency option. 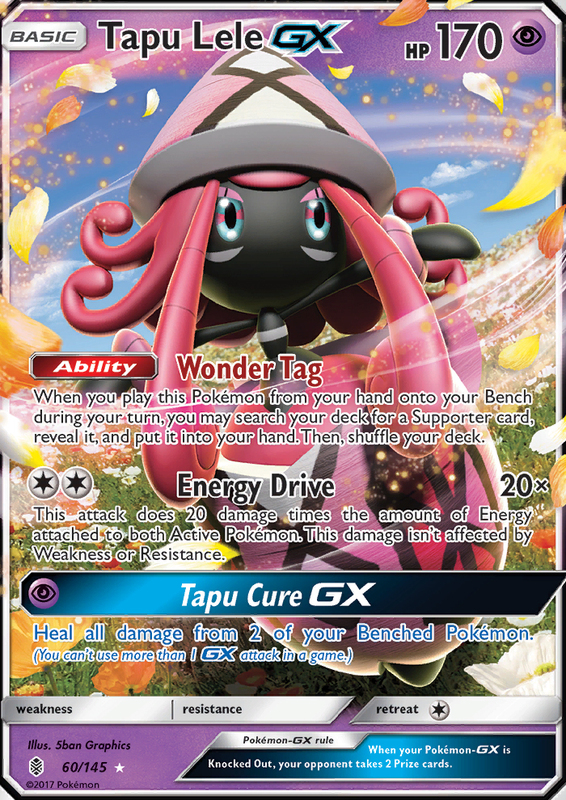 As with every other deck, Tapu Lele GX allows us to convert our Ultra Balls into Supporter cards, and through Wonder Tag we gain better access to our niche Supporter cards and can more purposefully craft our strategy. I also cut out Tauros GX from the deck and replaced it with a second Tapu Lele GX. Not only does Tapu Lele GX give the deck extra consistency, but it is a one Energy attachment Basic attacker that can hop in and attack for you if you need it to, and which also can be used to deal with something like Glaceon EX in which you need a Basic attacker to damage it. 1 Oranguru SUM – This is something I added in last format sometime after I had written my article. It can give you some extra draw throughout the game, can be searched out and used with Brigette, and helps protect you from your opponent’s late game N’s. With Special Charge, there are plenty of Double Colorless Energy to go around, so if you can get a stray attachment onto Oranguru at some point in the game it can also jump in as a fairly decent attacker that can clean up if you place your snipe damage in the right places. 2 Zoroark BREAK – This was already in here, but I upped the count to two. With Brigette, we are able to evolve through our Zoroark lines more consistently and with so many powerful attacks on the Pokemon released in both Sun and Moon and Guardians Rising, copying attacks for a single Darkness Energy has become so much better. 1 Brigette – Like my other evolution decks, thanks to the great power of Tapu Lele GX’s Wonder Tag, we can now play Brigette. This is the optimal turn 1 play for the deck, and it greatly increases the consistency of the Zoroark part of the deck as you can use Brigette to get 2 or 3 Zorua benched to start the game and then you will pretty much be set to evolve instantly throughout the rest of the game. Thanks to Brigette, I have had tons of games where I’m able to get a very threatening 2 Umbreon GX plus 2 Zoroark field developed on just the second turn of the game. 1 Field Blower – I replaced one of my Stadium slots with Field Blower as it gives me the versatility to remove opposing Stadiums as well as their Tool cards. 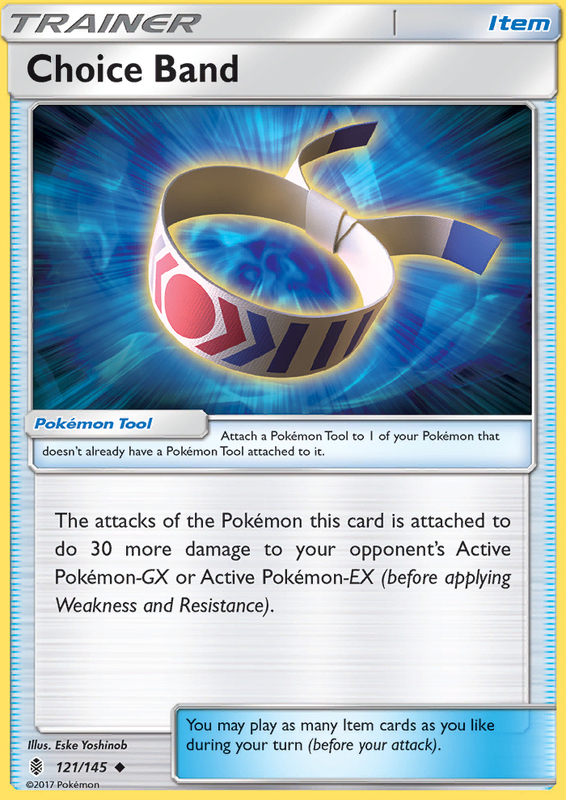 4 Choice Band – This is perhaps the biggest addition to Guardians Rising that helps unlock the true potential of both Umbreon GX and Zoroark. 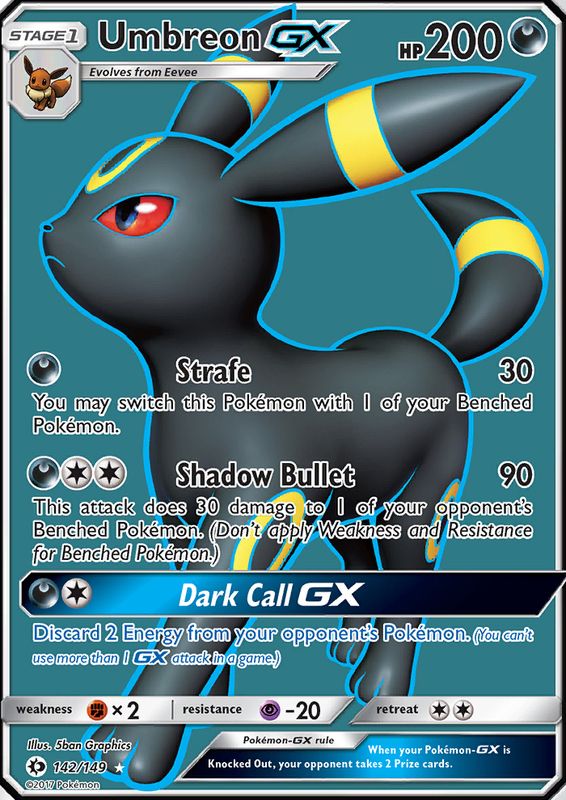 For Umbreon GX, it can now do 60 damage to EX/GX Pokemon with its Strafe Attack and 120 + 30 with its Shadow Bullet attack. The 60 + 120 combos for a knockout on 180 HP EX/GX Pokemon, and it can be boosted to get into 200 range if one of the attacks is used in conjunction with Professor Kukui. Against bulkier EX/GX Pokemon, Shadow Bullet will now 2HKO most Pokemon, and can 2HKO even the biggest stuff like Solgaleo GX or Primarina GX with a previous snipe or Professor Kukui. Zoroark also becomes a lot more threatening of an attacker. If your opponent has a full bench, Zoroark can now reach up to 190 damage, or 210 damage with Professor Kukui. You can actually even do 180 damage with Choice Band and Professor Kukui against a 4 Pokemon bench. Zoroark BREAK also now hits better damage numbers thanks to Choice Band. It can copy something like Lapras GX’s Blizzard Burn or Drampa GX’s Beserk to OHKO them when you have Choice Band attached. 1 Altar of the Moone – This gives the deck another retreating option for anything that has a Darkness Energy attached to it. I replaced the Reverse Valley with it because with Choice Band I find Reverse Valley not really being very relevant to hitting proper damage numbers. Depending on how the meta game develops, I would consider putting Reverse Valley back in. For example, if Zoroark picked up in play, Reverse Valley could become useful in the mirror match for allowing Umbreon GX to hit for 100 damage against an opposing Zoroark. For most of my testing with this deck, I’ve had both Flareon AOR and Vaporeon AOR to help my matchups against Grass, Metal, and Fire decks. However, Fire has mostly fallen by the wayside. Volcanion EX has apparently fallen out of favor with most players and has stopped seeing serious competitive play in most areas. Because no one is playing Volcanion EX, I ended up taking out the Vaporeon AOR for a 4th Choice Band to make sure I had better access to those throughout the game. If Volcanion EX starts seeing more play again, you simply cut a Choice Band out of the deck to fit Vaporeon back in. 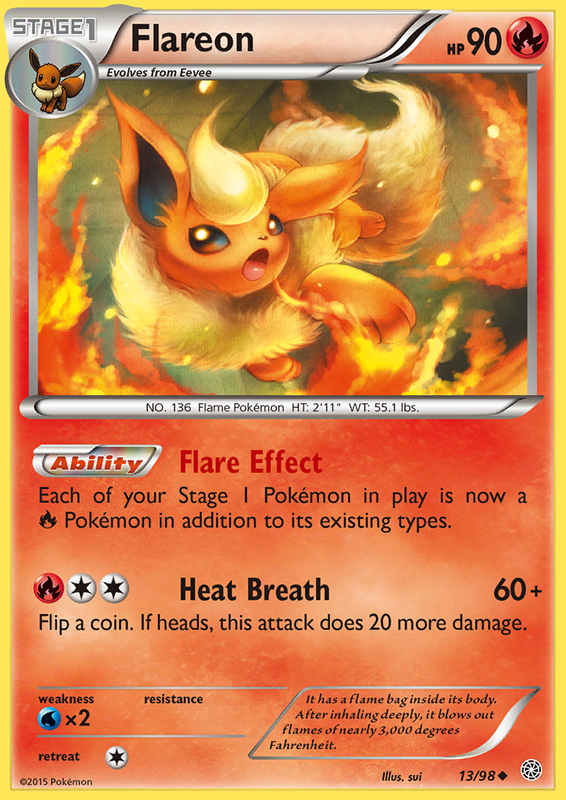 As we move through the format with Guardians Rising, I would expect decks that are weak to Fire to pick up in play. 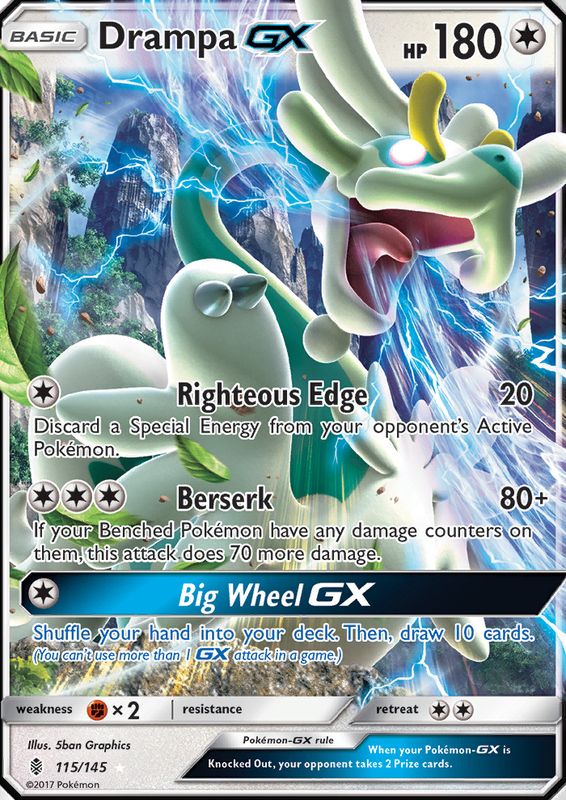 Decks such as Solgaleo GX/Rayquaza and Metagross GX have pretty solid Garbodor matchups and could see an increase in play. Additionally, Grass types get a boost with Tapu Bulu GX, so Flareon could be useful against some Grass decks that pop up. Tapu Bulu GX doesn’t have a Weakness itself, but from what I’ve seen online, it’s typically played with Lurantis GX, which does have a weakness to Fire. Of course, Decidueye GX/Vileplume is also still a threat, so Flareon is also going to be useful for dealing with that matchup too. From my testing with the deck, Umbreon GX/Zoroark is very strong against Drampa GX/Garbodor. With a Choice Band, Umbreon GX easily 2HKO’s a Drampa GX between Strafe and Shadow Bullet (60 + 120). It is also typically able to survive Drampa GX’s Beserk because of it’s 200 HP, forcing Drampa GX to at best 2HKO it unless they play Professor Kukui, which many lists don’t. If they have Team Magma’s Secret Base in play and you can’t counter it, you can avoid picking up damage counters onto your Pokemon by playing Brigette, which puts the Pokemon onto your bench straight from your deck, avoiding the damage counters from Magma Base. In addition to Umbreon GX as an attacker in the matchup, Zoroark BREAK can copy Drampa GX’s Beserk with Foul Play and can OHKO it if it has a Choice Band attached and one of your Pokemon has damage counters on it. 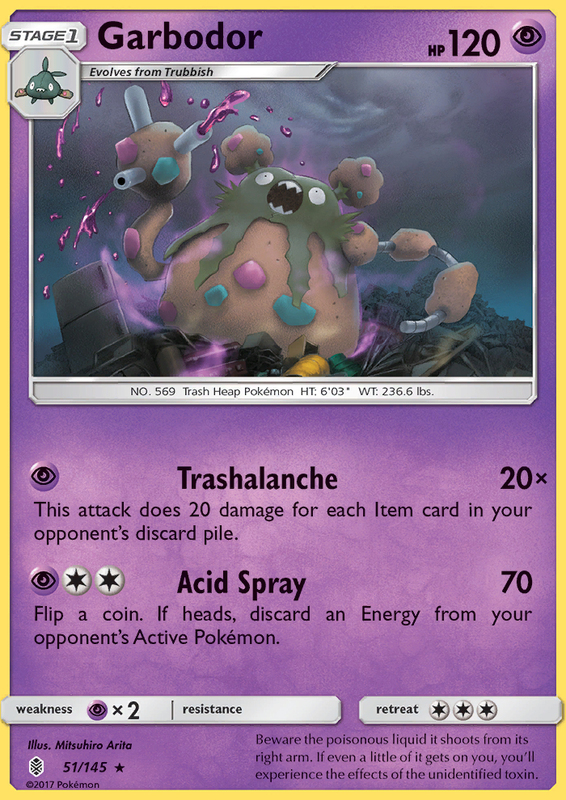 As for dealing with the Garbodor part of the deck, you are setup fairly well to do so. All of our primary attacking Pokemon have a Psychic resistance, which helps give a little bit of a buff, making it difficult for Garbodor to pick up early knockouts. As for knocking out Garbodor, we have lots of good options for that. You can use Shadow Bullet combined with Lysandre over the course of two turns to knockout two at the same time. If they have a big bench, Mind Jack can be used to knock one out, and last but not least, you can also copy Trashalanche with Foul Play and OHKO them. The combination of having a strong one prize attacker in Zoroark / Zoroark BREAK, the deck resisting Psychic type, and Umbreon GX being able to get searched out and setup without using Items makes this deck a good option for beating Drampa GX/Garbodor when piloted correctly. Against the Espeon GX version of the deck you’re very well suited to deal with Espeon GX as you can get around its Confusion with Stand In, and it doesn’t have any good ways for dealing with a Zoroark BREAK. 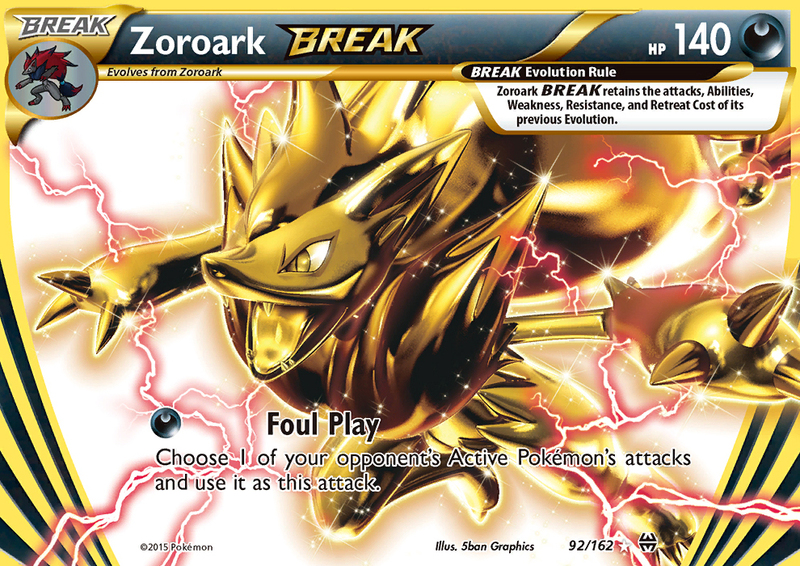 With so many strong attacks on the new GX Pokemon, there are tons of opportunity to use Zoroark BREAK throughout games. Combined with the snipe from Shadow Bullet, if you have a Choice Band on Zoroark BREAK, there is usually something you can copy to let you get a big OHKO on opposing GX Pokemon. This is always worth a reminder, as not taking this into account could lose you a game. 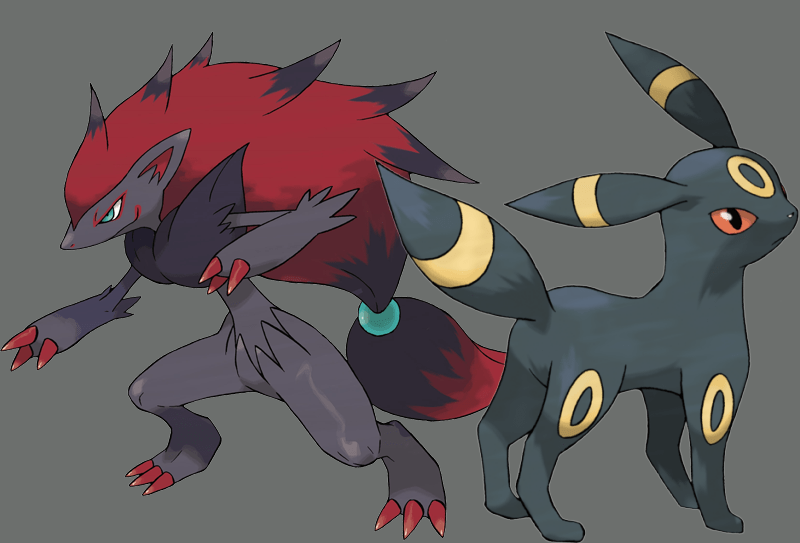 Zoroark BREAK is a BREAK Evolution and not a Stage 1, meaning that if you evolve into Zoroark BREAK you won’t be able to take advantage of Flareon AOR (or any of the other Ancient Origin Eeveelutions if you put them back in) to hit the opponent’s Pokemon for weakness. 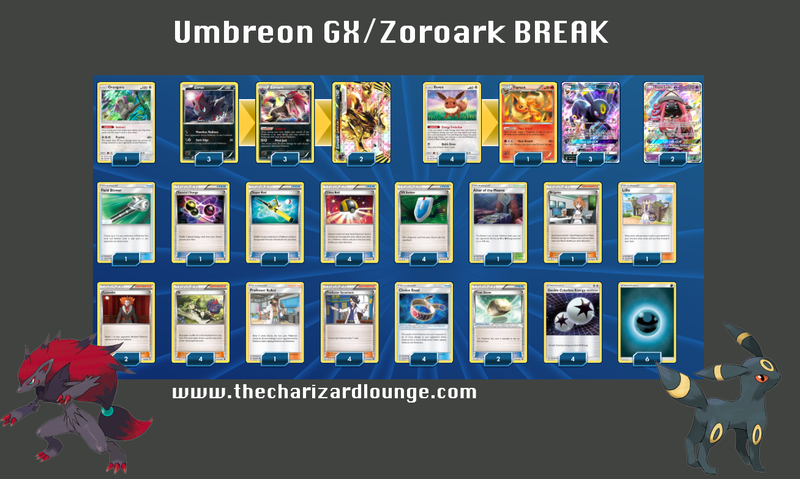 Umbreon GX/Zoroark seems well positioned to do well in the coming weeks. It functions very well against Drampa GX/Garbodor and Espeon GX/Garbodor, the two best decks in the format based on Seattle Regionals. Some matchups that may have been difficult, such as Greninja BREAK, appear to have fallen out of favor, while favorable matchups against Grass/Metal decks should come to its benefit if players start looking in those directions for dealing with Garbodor. I’ve put in a lot of time with this deck dating back to the release of Sun and Moon, and it’s always performed well for me. With Umbreon GX giving it unconditional solid damage output, and Zoroark and its BREAK being able to explode for big damage or big effect in the right situations, this deck has always seemed to have some answer for giving it a shot in almost any matchup. With Vespiquen already being outed as being good with Jeffrey Cheng’s 2nd place finish in Seattle, and it now being likely to be countered by Oricorio in Madison, if I were going to Madison this would be the deck I would play. Do you think this deck would be good at Birmingham regionals in the seniors division? Yeah, should be good in most meta games as long as there isn’t a ton of fighting/Greninja. I really like this list. I made a couple modifications due to personal preference (Dropped Oranguru and Lillie for a stadium and a 4th Zorua). Curious how much use you get out of Oranguru. I found that I very rarely got my deck down below 3 cards even with the Delinquent threat increasingly prominent. Also, I have found the Greninja match up particularly difficult. Any advice on it or should I just hope to dodge it (shouldn’t be too bad given how few people actually run it anymore)? I use Oranguru quite a bit, but not every game. Part of the logic behind it is that I can use Brigette on turn 1 with no other supporters and grab Oranguru as a 3rd if I have a hand that can burn down and then most likely draw into another draw out. I haven’t had time to test it yet, but at some point this month I’m going to try finding a cut to try out 1-1 Octillery in place of Oranguru. I remember 1-1 Electrode being amazing and Ross Cawthon always playing it, and that would definitely provide more utility than Oranguru. Greninja is just bad for the deck. It’s the exact type of deck that Greninja exploits, 2 prize main attacker and no OHKO. The best you can probably do is Giratina promo or Hex, but I’m not sure those do enough to swing it. I don’t think Greninja is great against some of the other top decks though, so it should hopefully fade out of the meta. I just can’t accomplish anything with this deck. Terrible draws almost every time. I have Acerola in my list. It’s very important to play toward the Acerola. Leave an unevolved Eevee or Zorua on the bench in waiting for the future. I just hope that it can be competitive in the current standard meta game. Zoroark gets OHKO by almost everything.